Bocage’s Wall Lizard (Podarcis bocagei), is another lizard which is endemic to (only found there in) the northwestern Iberian Peninsula. The adult males and females are sexually dichromatic – meaning that they have different colour patterns! The female lizards have a nice brown back (see photos on link 1), whilst the males have a lovely green back (dorsal side) as shown above. This straightforward dichotomy is however, somewhat complicated by the fact that some females have the same dorsal coloration as males! 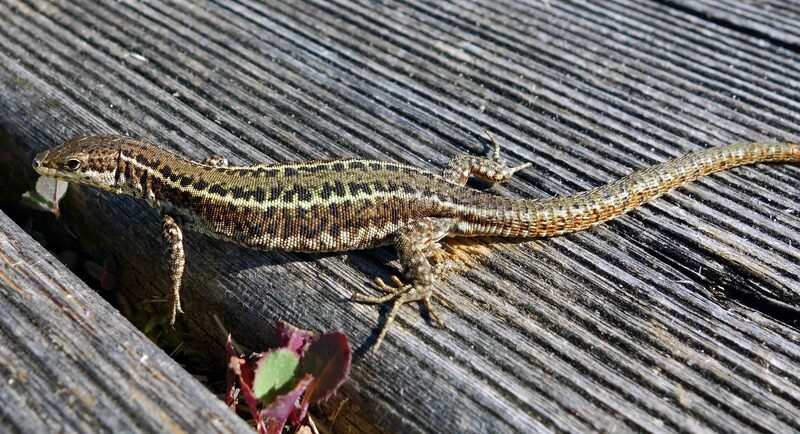 A study by Pedro Galán at the Universidade da Coruña suggests that the function of this green colour in females is to signal to males that they have fertilised eggs inside (the lovely word ‘gravid’ applies to both ‘pregnant’ lizards and insects); in other words “to avoid harassment and copulation attempts by males following fertilization” (Galán, 2000). Receptive females are brown, but turn green, perhaps to say ‘I want to get on with the business of developing my eggs, I don’t want to be chased any more thank you’! Egg laying takes place between May and July and up to three clutches of eggs can be laid; the baby lizards hatch out between July and September. These photographs were taken in Galicia on 7th July 2012, so it is possible that the green coloured individuals are not males, but gravid females! These lizards were sunning themselves (or perhaps defending territories?) on the boardwalk of the Pria (playa or beach) de Morouzos near the coastal town of Ortigueira in Galicia (northwest Spain). 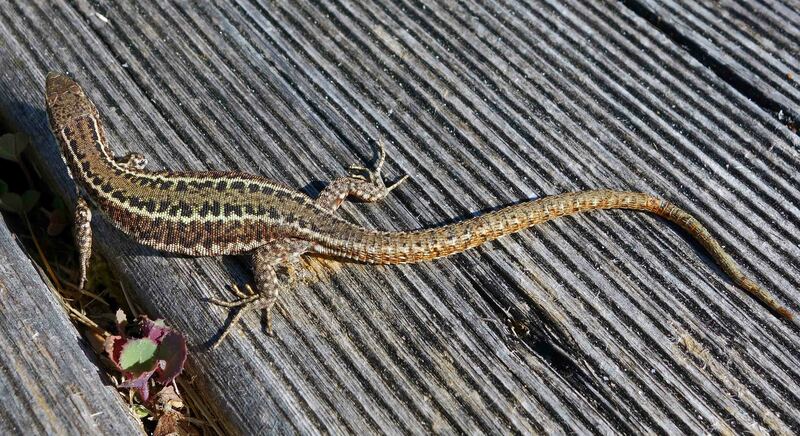 2) Pedro Galán and A. H. Price (2000) Females that Imitate Males: Dorsal Coloration Varies with Reproductive Stage in Female Podarcis bocagei (Lacertidae). Copeia: August 2000, Vol. 2000, No. 3, pp. 819-825. 3) Galán, P. 1997. Reproductive ecology of the lacertid lizard Podarcis bocagei. Ecography 20:197–209.